The NVIT Merritt campus sits on land that was occupied by First Nation people from the Nicola Valley. With this in mind, a collaborative undertaking was initiated between local Elders and the architect, their focus being to create an environment that addressed the needs of a modern academic institution while at the same time inspiring Aboriginal education through our proud heritage and culture. The building is named for Frederick Gordon Antoine whose role as a founding member of NVIT and as a strong advocate for quality education for all First Nation People inspired its creation. Gordon was instrumental in the establishment and management of NVIT. He served as a member of the Board since NVIT's inception in 1983 to 1998. 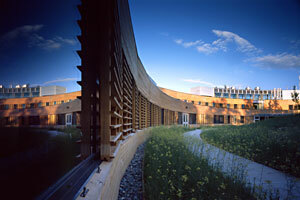 Awards - The NVIT Merritt campus has been the recipient of three major architecture awards including: Lieutenant-Governor of British Columbia Awards in Architecture for Excellence in Architecture in 2002, The Governor General's Medal in Architecture 2004 and the 2005 Excellence in Planning and Excellence in Architecture Honor Award. Merritt is a small community nestled in the Nicola Valley in the Central Interior of British Columbia. Located just 45 minutes from Kamloops, one hour from Kelowna and two and a half hours from Vancouver, every amenity for every lifestyle is available. Merritt offers its residents a diverse array of entertainment and recreational activities allowing individuals to get directly involved with the community. These include numerous clubs, a Friendship Centre, organizations, youth groups and sports teams. Apply now!